A foul-mouthed living teddy bear and his childhood hero come together for an unlikely trio of movies in Ted vs. 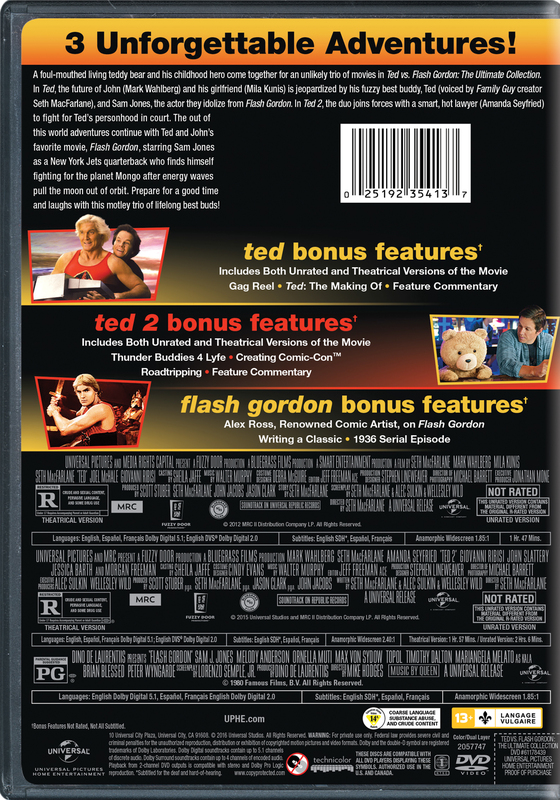 Flash Gordon: The Ultimate Collection. In Ted, the future of John (Mark Wahlberg) and his girlfriend (Mila Kunis) is jeopardized by his fuzzy best buddy, Ted (voiced by Family Guy creator Seth MacFarlane), and Sam Jones, the actor they idolize from Flash Gordon. In Ted 2, the duo joins forces with a smart, hot lawyer (Amanda Seyfried) to fight for Ted's personhood in court. The out-of-this-world adventures continue with Ted and John's favorite movie, Flash Gordon, starring Sam Jones as a New York Jets quarterback who finds himself fighting for the planet Mongo after energy waves pull the moon out of orbit. Prepare for a good time and laughs with this motley trio of lifelong best buds! Writing A Classic: Screenwriter Lorenzo Semple, Jr.